Hello, I am Cole Vanwey. I am a youth advocate who works to transform systems that impact youth in their transition to adulthood. I am a member of Humboldt County’s Behavioral Health Board, and a commissioner on the Juvenile Justice and Delinquency Prevention Commission. Members, friends, and staff of the Humboldt County Transition Aged Youth Collaboration. 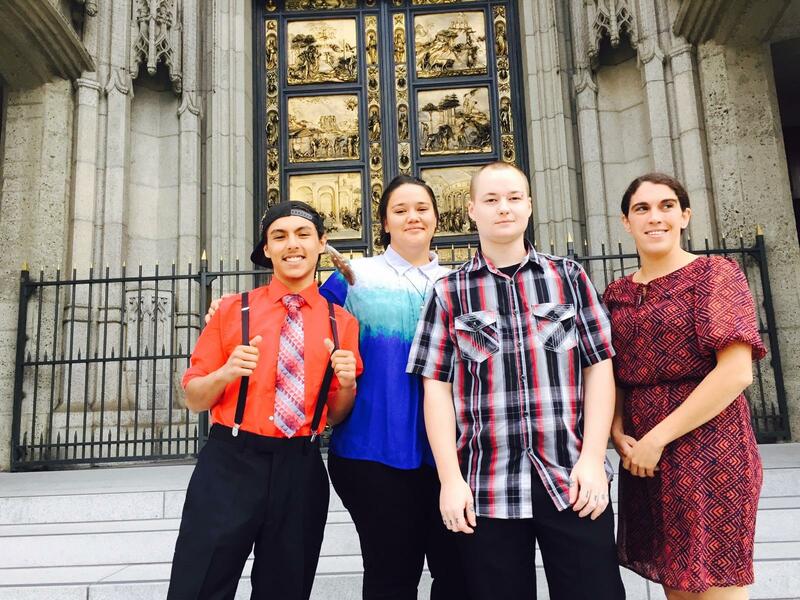 From left, Tristin Severns, Ipo Ma’e, Cole Vanwey, and Leah Lamattina. I am also an advisory board member for the Humboldt County Transition Age Youth Collaboration (HCTAYC). We are an advocacy group based in Humboldt County and we work to educate our community and bring youth voice to decision making tables locally and nationally. Our four focus areas in which we create impact are: foster care, mental health, juvenile justice and homelessness. HCTAYC is a partner Organization of the Y.O.U.T.H. Training Project (YTP) and California Youth Connection (CYC). 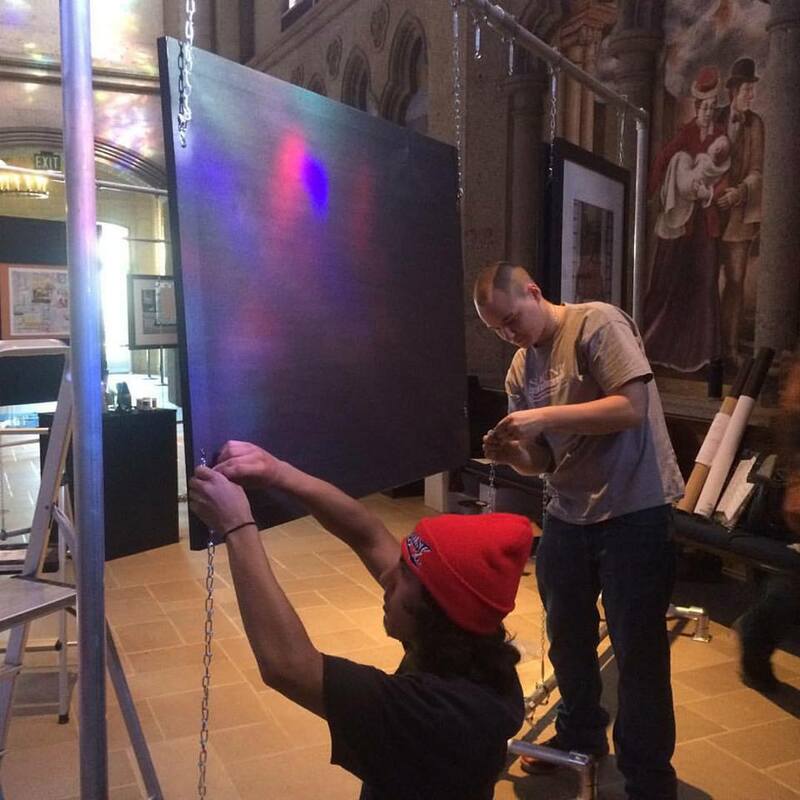 I want to tell you about my experience working in partnership with YTP to help set up the Foster Youth Museum’s Lost Childhoods exhibit in Grace Cathedral of San Fransisco. As an advocate I do a great many things. I attend local meetings, give trainings to systems impacting professionals, participate in conferences nationwide, develop curriculum… the list goes on. Throughout my three years of advocacy, my greatest tools have been my voice, my ability to write, and to carry out trainings. Working to help set-up the Foster Youth Museum has been quite a different experience as far as advocacy goes. I have never set up a museum, though I have had a lot of experience with miscellaneous jobs building, cleaning, painting, and other laborious tasks. Cole Vanwey and Tristin Severns working on hanging the exhibition’s photography. Setting up the exhibit was indeed quite a bit more tedious than I had expected. We had to drill into stands so we could prop up certain vitrines to be more visually appealing. The stands required a bit of touch-up with paint. Cleaning was a constant. Setting up the vitrines, we had to be mindful of fingerprints and dust. There was a lot of moving things around and mindfulness about how people take things in visually. Changing angles, adjusting lighting and measuring the distance between images are just a few examples. I enjoyed learning about the strategies the museum used to present information for various ways of thinking. We used video, sounds, images, documents and written materials. So many things go into setting up a traveling exhibit, one of the most important being where you decide to set it up so that you might capture the right audience or get a lot of interested viewers. The Grace Cathedral in San Fransisco was absolutely stunning. Our team was very fortunate to work in such a beautiful environment, and we were very appreciative to have such a great venue. If you have not seen the magnificence of the cathedral I recommend you check it out. The architecture that is put into the place is truly unique. The sun beaming through the vibrant colors of the enormous and numerous stained glass windows cast a rainbow of light throughout the building, greatly complimenting the appeal of our exhibit. The traffic of people in and out throughout each day was quite surreal and was a wonderful opportunity to get interested viewers for the exhibit. Overall I could say that my experience working at the museum was enlightening. It helped teach me of yet another way to advocate and make a difference in the systems that are set to support our youth into transitioning to adulthood. One of my favorite things about the Museum is the fact that it captures a timeline of peoples’ experiences through an ever changing system. There is a lot to be learned here, including how the system has changed and how so many of our stories relate. It is emotionally healing for me to see so many people selflessly putting their stories out there so that it may impact others and truly make a difference in the way we think of each other and our experiences. The Foster Youth Museum is a wonderful tool of advocacy and if you have not checked it out, you are missing out.